John Pawson has applied his pared-back architectural style to a range of furniture with trestle-style supports. 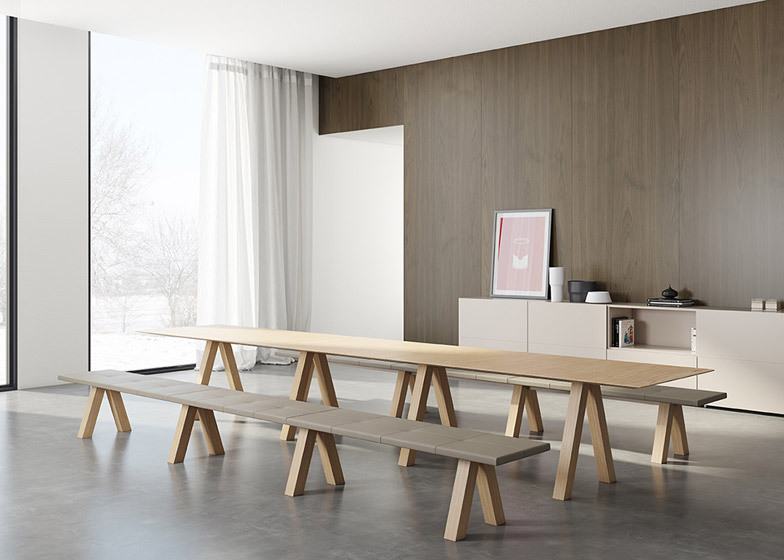 Designed for Spanish brand Viccarbe, the collection by British designer John Pawson includes a bench and table with inverted V-shaped legs that resemble trestles – after which the furniture is named. The chunky oak legs are spaced at standard intervals along the lengths of the benches, meaning that the number of supports determines how long each one becomes. Taller versions in the same material are used for the tables. Thin boards are placed on top of the supports to form the seats and table surfaces. "The design of the table and bench for Viccarbe sets a refined horizontal plane above graphically spare supports, echoing medieval functional arrangements of loose boards laid across trestles," said Pawson, who is currently overseeing construction work on London's new Design Museum. "The simplicity of line, junction, geometry, rhythm, surface and proportion means that the primary experience is of the beauty of the unadorned oak." Available either smooth or quilted, the upholstered seats can be paired with a wall-mounted backrest for use in waiting rooms and restaurants. Renowned for his minimal building designs, Pawson has previously completed a church in Germany illuminated by softly diffused daylight and designed a black brick holiday home for Alain de Botton's Living Architecture series.